To be clear, anti-Muslim hate crimes, as with such crimes against any group, are always indefensible, but it’s important to note that claims made by many at The Guardian of a “rising tide of American Islamophobia” have no basis in fact. Contrary to the popular narrative, Muslims are not under siege in the U.S., and indeed enjoy economic prosperity, religious and civil rights which would be unimaginable in most other countries. 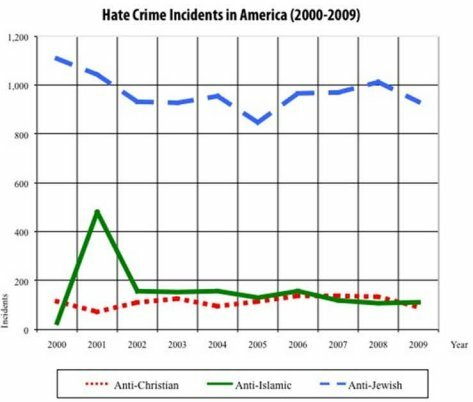 A 40 page report by the Center for Security Policy, which looked at, among other factors, FBI Hate Crime Statistics over the past 9 years, demonstrated that Jews are far more likely to be victims of hate crimes in the US than Muslims. Yet, the mere dearth of evidence has never been a barrier for the Guardian and CiF columnists in advancing a narrative of a Muslim community in the U.S. under siege. Here’s an essay by CiF’s Sarah Wildman on July 28, 2011. And, here’s the headline from a CiF essay on Aug. 26, by Wajahat Ali. The Guardian’s Jonathan Freedland, in an essay on the 10th anniversary of the attacks on 9/11, wrote that he was more worried about the “rampant Islamophobia” which was “on the rise” in the U.S. than the threat of Islamist terrorism. Well, adding to the realm of data disproving the argument that there’s anything approaching a rise in Islamophobia in the U.S. is the latest FBI Hate Crime Data for 2010, which shows, once again, that hate crimes against Muslims remain rare and are far outnumbered by attacks on Jews. In 2010, only 13.2 percent of religion-based attacks were directed at Muslims. By comparison, 65.4 percent of such crimes were directed at Jews. Moreover, the far greater number of attacks on Jews is, by no means, evidence that the United States is a country dangerously antisemitic. By any reasonable standard or observation, Jews enjoy more freedom and prosperity in the U.S. than anywhere else in the diaspora. So, how can anyone rationally argue that the far fewer number of assaults on Muslims prove that Islamophobia is rampant? If the question of whether there was a rising tide of Islamophobia in the U.S. was dictated by facts, reason, and data – that is, if it wasn’t driven by ideology – the debate would have ended long ago. As such, you can certainly expect more intellectually unserious charges of rampant anti-Muslim racism in the U.S. by commentators at the Guardian. I think they don’t wish to report them because they don’t want to anger Muslims, thus provoke them to go on the rampage, thus creating more victims of Muslims… which they’ll have to downplay anyway. See how it works? In the past The Guardian was a paper that deserved and earned respect. Now it stands for nothing more than jejune posturing, superficiality and callow prejudice. The Guardian’s coverage of Islam now consists almost entirely of lies. But the British public aren’t buying it any more. In a recent Yougov poll, 15% of respondents claimed that a large proportion of British Muslims were prepared to condone or even carry out terrorist acts, and a further 63% wished to see our security services focus on Muslims living in or seeking to enter this country, on the grounds that, although most Muslims were not terrorists most terrorists threatening Britain were Muslim. No wonder the Guardian’s circulation is dropping faster than any other national paper in the UK. They just won’t address the issues that matter to people. A Jew is almost 10 times more likely to face a hate crime in the USA than a Muslim. The Guardian is a Muslim Brotherhood mouthpiece.